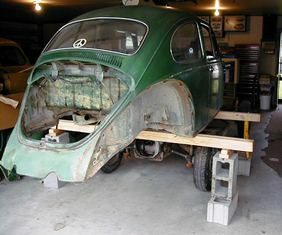 With a lot of time and effort, I removed the fenders, hoods, and other parts and managed to get the body unbolted from the body. It goes to show just how light these cars are since I managed to do this all by myself. 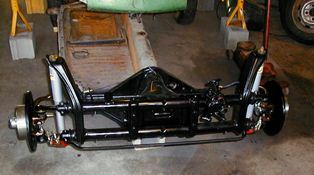 Then I started working on the front end. I wanted to update this little bug to things that were safer, so I opted to go with disk brakes. There was a fair amount of elbow grease needed to clean up the front end from the starting condition. As you can see - one side of the floor pans has been removed but not the other side. The reason this didn't happen was because I didn't have the skills to weld the replacement pan back into place. So - this little guy now sits. 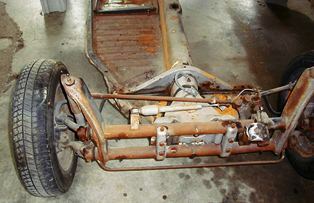 The body is parked on the partial frame and is resting. He is waiting for the time (and money) that I can finish the work. Learning to weld and getting the right equipment is in my near future.